All participants will take home print-outs on the cheese making process, as well as kefir culture, kefir cheese & bottle of whey. Class size is limited to 16 people. Courtney Tyler found herself with a growing discontent with the disconnect most of us face in relation to our food supply.​ This, ​coupled with an interest in learning to use the wild herbs and plants that grow in abundance around us all, drove Courtney to focus on and actively practice the above issues. ​Wishing to make changes to her lifestyle, she moved to the country with her son and partner and this enabled her with the opportunity to further explore and deepen her awareness of and connection to nature. She has always had an interest in herbal medicine and an apprenticeship with Judith Hoad in Donegal only strengthened this desire to learn to live sustainably and to put permaculture principles to work in her environment. 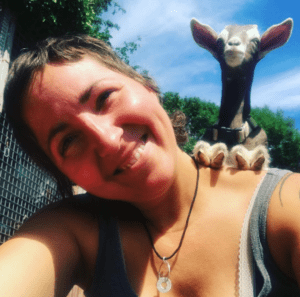 She makes her own yogurt, cheese and kefir from her own raw goats’ milk and grows some of her own vegetables and herbs in her garden, many of which she ferments into sauerkraut and kimchi and pickles. Sourdough breads, naturally fermented ginger sodas and kombucha teas are staples in her home.